Whether you cannot wait to head back into your classroom, or whether you are wishing for a couple extra weeks of summer, back to school time is inching closer. 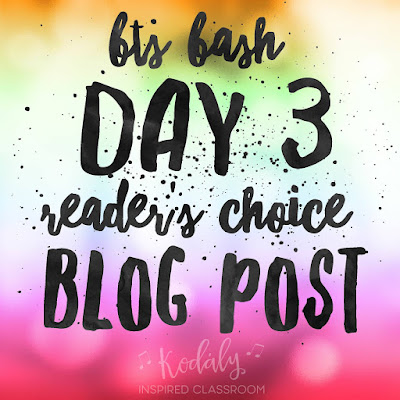 I decided to throw a little Back to School Celebration on my blog and Facebook page to help music teachers get excited and prepared to return to school. 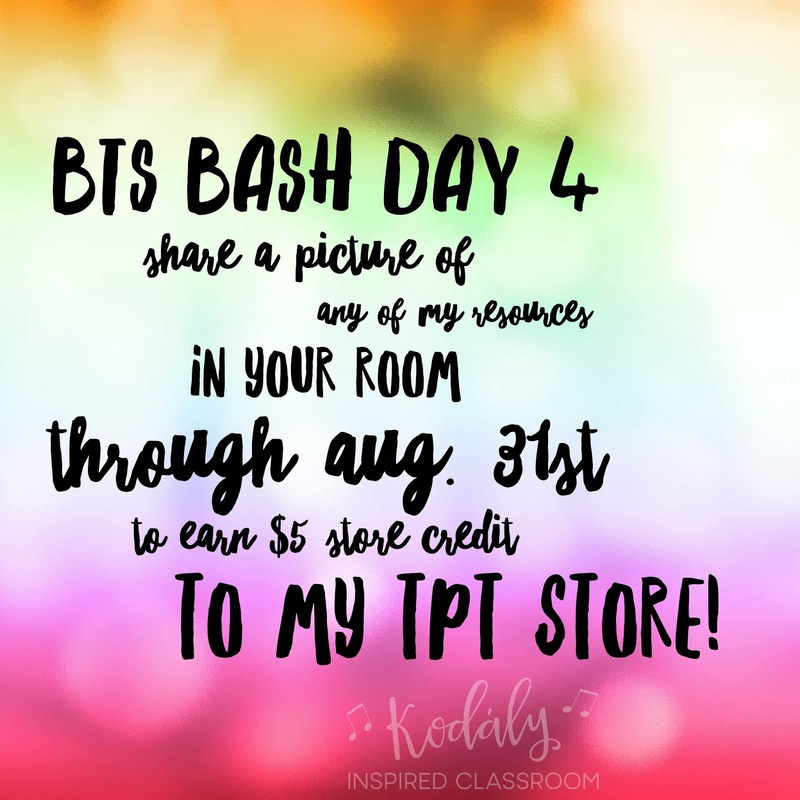 I haven't shared this on my TpT Facebook page or blog yet, but now seems like a great time to tell my readers that I will not be returning to the classroom this year. There were a couple reasons that was the right decision for my family, and the first was that we are expecting a new baby in December! My daughter, Ellie, is so excited that she will get to be a big sister, and we will have our hands full with a new baby girl! I went back to work when Ellie was only 7 weeks old and it was so hard to leave her, to teach on so little sleep, and to worry about pumping/leaving to nurse her over lunch while I was at school, so it will be nice not to have to worry about that (or having a long term maternity sub in my room). The second reason is that Ellie will be starting preschool this year and she is going to a half day preschool program and it wouldn't have worked with my school schedule to drop her off and pick her up and the appropriate times, and I don't know what it is like in your area, but full day preschool is EXPENSIVE! So I am looking forward to getting to spend more time with her before the new baby comes, and then both of them after that! 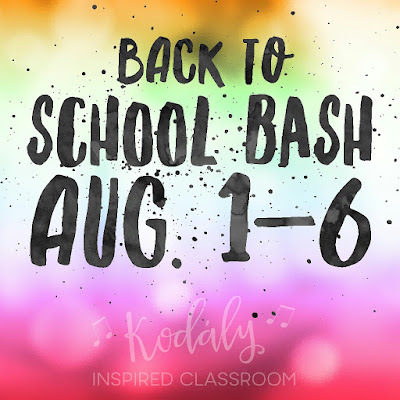 But, for those of you who are heading back to school this fall, I hope this Back to School Bash will get you excited and ready for those sweet kiddos! Save 28% in my tpt store with the code BestYear at checkout! In addition to the great savings, I am offering a special deal on top of that. Email me at LindsayJervis@hotmail.com with your username after your purchase of $30 or more, and I will give you $5 store credit for every $30 you spend! The $30 must be spent from Aug. 1-2 and I must receive your email by August 6th. Now available! 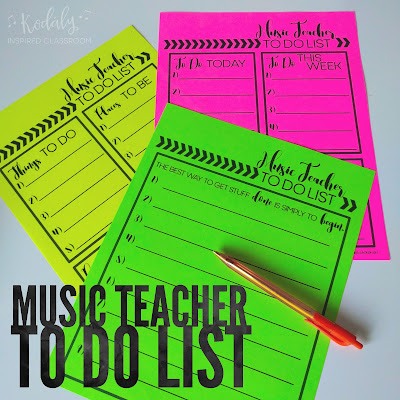 Easy to print music teacher to do lists to keep handy at your desk! Don't forget! 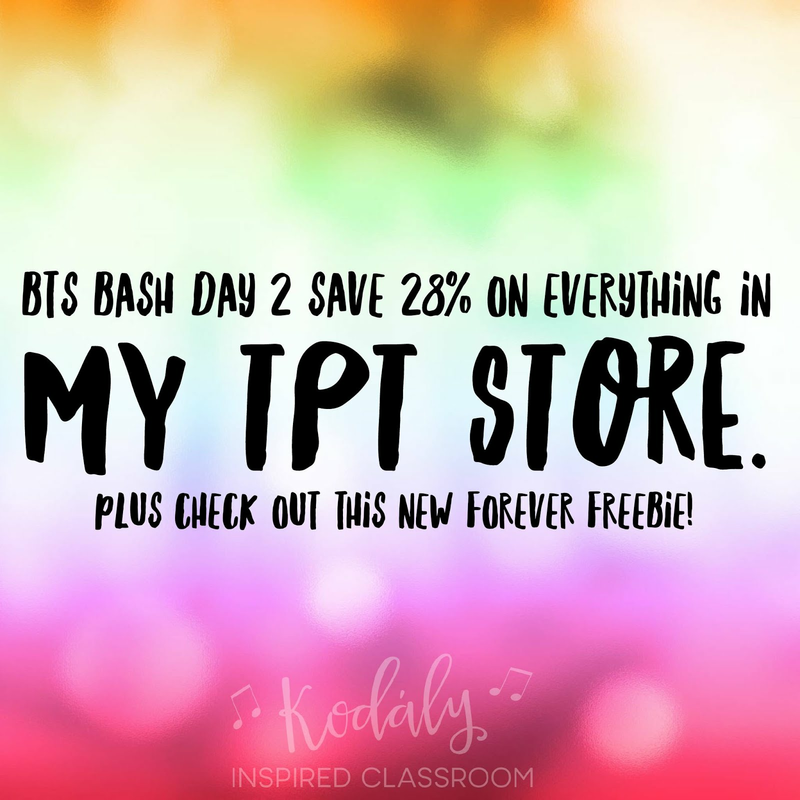 You can still save 28% in my tpt store with the code BestYear at checkout! In addition to the great savings, I am offering a special deal on top of that. Email me at LindsayJervis@hotmail.com with your username after your purchase of $30 or more, and I will give you $5 store credit for every $30 you spend! The $30 must be spent from Aug. 1-2 and I must receive your email by August 6th. 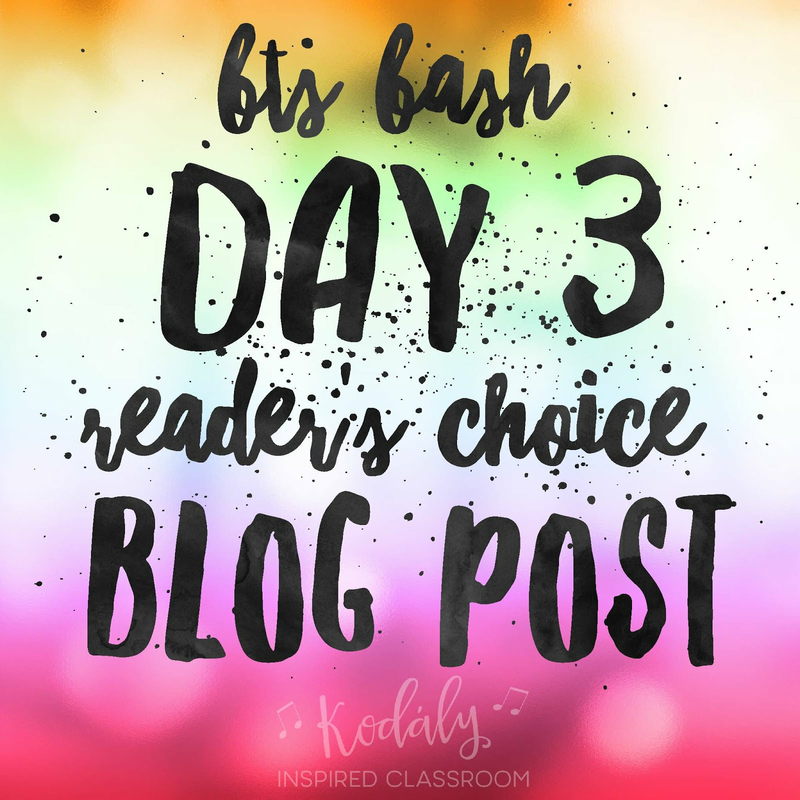 Comment on my BTS Bash Day 3 Facebook Post to let me know what you would like for me to blog about during the month of August. I will pick one of the topics that is listed and create a blog post on that topic before the month is over! I will add all of the other ideas to my "blogging" list to hopefully blog about in the future! 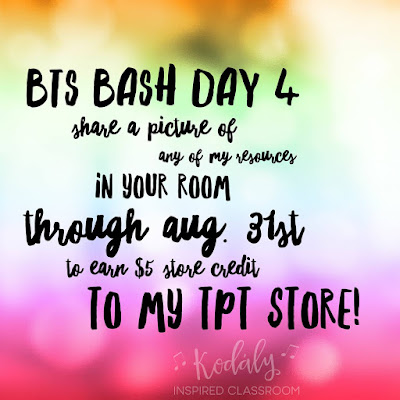 Starting August 4th and going through August 31st, share a picture of any of my resources in your room (either on Facebook or via e-mail at LindsayJervis@hotmail.com) with permission to use the photo on my blog/social media to earn $5 store credit (feel free to share as many pictures as you like, but it will only be $5 store credit per person). Join my "Share Group" on Facebook to get access to secret day-long flash freebie (August 4th only). 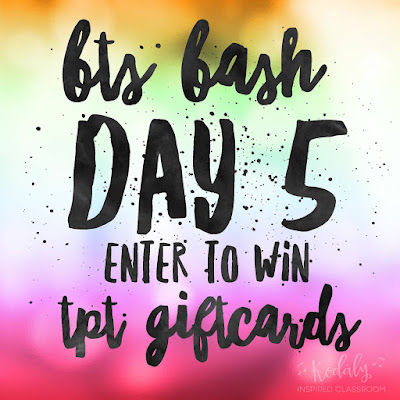 Enter on August 5th to enter to win a TpT gift card. 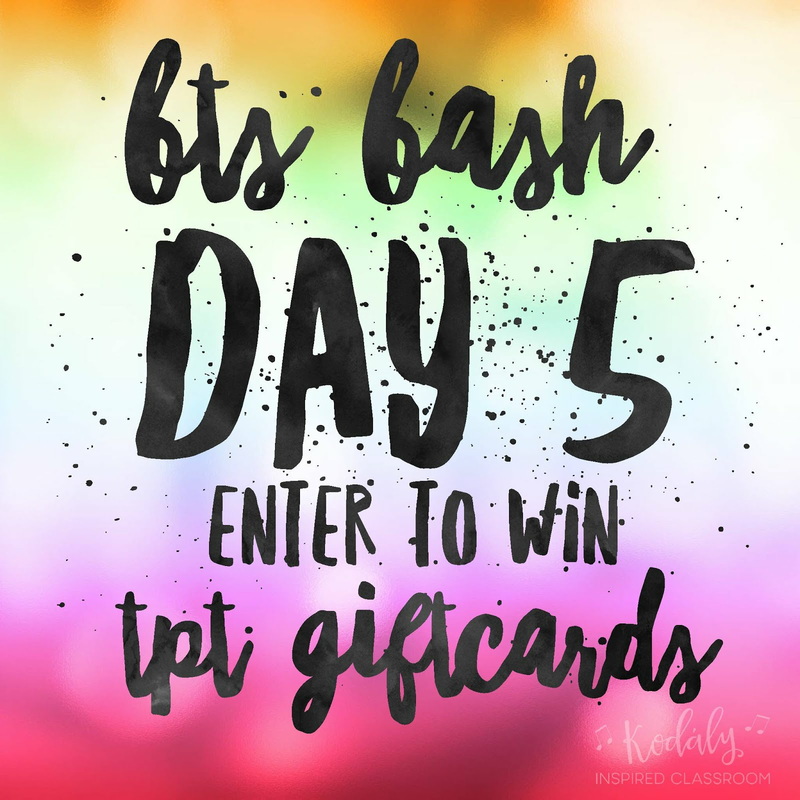 Don't be late though, winners will be announced at 10 PM Central Time on August 5th, so get your entry in early! All winners have been selected, and gift certificates have been sent via email! 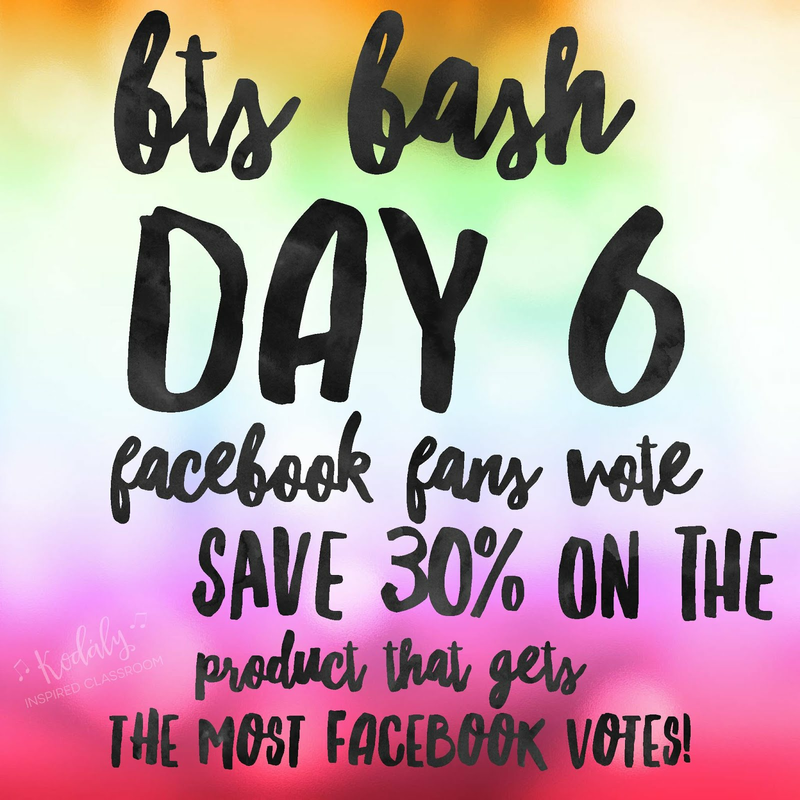 The day before (on August 5th) I will put a poll up in my "Share Group" on Facebook to vote on which product you would like to see 30% off. Whichever product gets the most votes will be marked 30% off one day only, August 6th. I hope this Back to School Bash will get you (at least a little) more excited to be heading back to school! Thanks for reading my blog and following my store and Facebook page! Yes! Hoping to have some time for it, especially this fall. Who knows what my days will look like once I have two kiddos, but I am sure we will find a routine that works! Good luck to you and thanks for always posting and making the best resources to use in the classroom. I am so happy for you that you get to be home with your family. God bless you! Congrats Lindsay; you'll have your own little classroom at home and without all the admin works that bogs us down. Thank you for helping US get excited (I'm wanting more summer-sigh). Glad you'll have less stress. Thank you so much, Christy! It will certainly be different, and although I am sad to be away from the classroom this year, I am looking forward to the time with my babies. They are only little once! Congrats Linday! You will love being at home with little ones. You're still teaching; just moving to a 'new' school ;-) Your resources are appreciated by so many-thank you! :) Thank you! I love looking at it that way! Congrats! Thanks for everything you create! I'd love to see a blog post with tips for music teachers that don't have a classroom but have to move room to room on a cart. I have been a traveling teacher between three buildings, but I have never been on a cart. Sounds like a great opportunity for a guest blog post though from someone who has been there/done that! Thank you--I love your blog! Congratulations on your second! Thank you so much for all of the hard work you put into your resources! Congratulations! A new baby and a new adventure! I wish you the best on this new path. I love reading your stuff and pretty much have purchased all of your products. :) cheers! Congratulations! Thank you so much for sharing your hard work with us! In my district, I was unable to take a year long year of absence, so I resigned and they hired a great Kodaly teacher to take my place. :) I have NO idea what to expect out of this year, what I will think about being home, whether or not I will go CRAZY, etc. I know I will be back in the classroom at some point, but I am not going to make that decision until a month or two after baby #2 is born. I think it will also depend on what is open. I have had people begging me to come teach in their districts, and there have recently been a ton of openings in the Wichita area, but I may be a little picky about where I apply to, because I would want it to be a school that my kids could attend, and I would want to make sure they were in a great school. Congratulations! I would love to read your thoughts on pairing with other enrichment teachers (art, PE, library) to promote fine arts. I appreciate the high quality and thoughtfulness you put into your products. I'm always anxious to see what you'll come up with next! Congratulations. Good luck. Hope I win a $10 gift card. I would love to hear how you integrate cross-curriculum learning. Do you ever collaborate with teachers outside of the specialists zone? Or even within specialists? I'd love to pair with my librarian or art teacher or even classroom teachers. Love showing the kids how music touches many subjects!! I would love more posts on singing games and folk dances for older children. Congrats on your growing family! Enjoy your time with them. 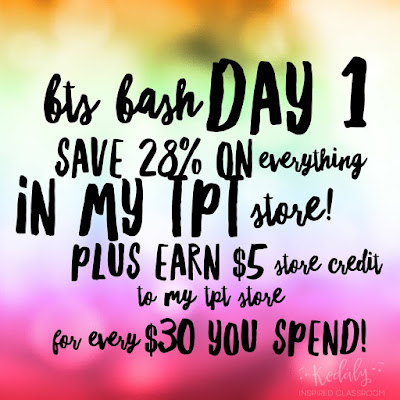 I secretly hope you have some time to continue putting out great products in your TpT store. Wow! I can't believe they won't let you take a year's leave! But there's always a reason for everything and clearly there is something awesome waiting for you when you are ready. I'm so excited for you and this new chapter in your life! 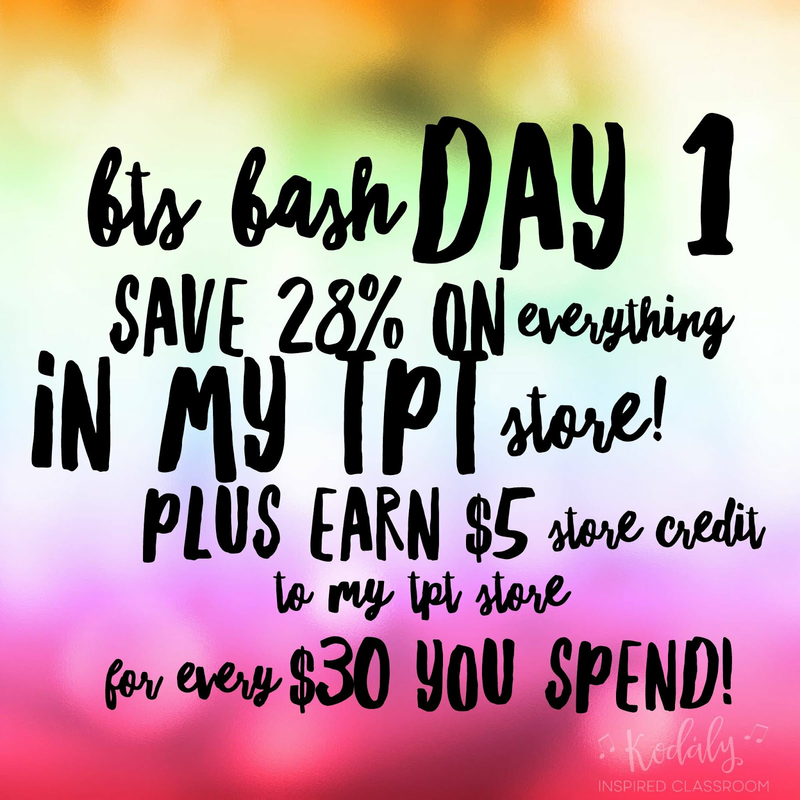 Thank you for still being willing to help us with your amazing TPT products! Best wishes! I love that I will still have this way to feel connected to music teachers, students, and classrooms! Congratulations! That is so exciting for your family. I would love more blog posts about incorporating literature in the music classroom. I would like to see some discussion on music centers in a Kodaly classroom. Congratulations Lindsay. I would like to see a post on special ed students mainstreamed into the classroom. I often have special needs kids that don't speak join a regular ed class. Congratulations on your second daughter! I don't think you'll regret being home! I went to a very part-time position after having my daughter... I only taught one day per week. Best thing I ever did. I'd love your thoughts on favorite songs for older classes (5th-6th). I am so very proud of you for taking this step! It is not an easy decision to make but what a blessing for you to be able to be with your kids. I would like to read a blog post about ideas for older students or a blog on HOW to use the wonderful concept files (do you basically go straight through the file OR do you integrate it with steps within your teaching--meaning you would do a few pages and then come back to the same file in a few weeks and then again a few weeks later...). I would LOVE to watch someone teach one of the concept files. Thank you!! !